Want to watch your MP4 movies on a DVD player? The best way is to use a program that facilitates the conversion from MP4 to DVD. In addition to enhancing your video watching experience, MP4 to DVD conversion also creates a physical backup of your files. Moreover, you can also customize your recorded videos, burn them to DVD and gift to a special someone. To facilitate the process, there are a number of desktop and online MP4 to DVD converters available. There are an array of programs and tools available that helps convert MP4 to DVD format online. Each of these programs comes with a specific set of features and functions. These online DVD to MP4 converters need no download or installation and can be used straight from your browser. Moreover, the majority of these tools are free to use and thus popular among users with basic conversion needs. Talking in simple terms, converting MP4 to DVD online basically means converting your MP4 files to VOB. Standing for Video Object, VOB is a container format that contains information related to video, audio, menu, subtitles, and others. So when you are using an MP4 to DVD converter online program, it’s mainly MP4 to VOB conversion that takes place. There is no burning of your files to the entire DVD structure and this is a major imitation of using an oline tool. A DVD structure contains a set of folders and files containing information about all the disc content. To make your selection process easy, we have picked up the 3 best MP4 to DVD online programs. This is a popularly used program to convert MP4 to DVD player format online. Using the tool you can convert our MP4 videos to VOB format in decent quality. Additionally, a wide number of video and audio formats are supported for further conversion needs. 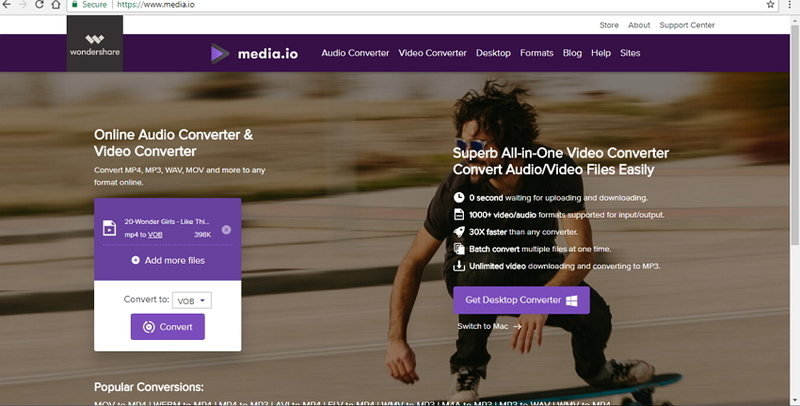 You can also convert your VOB files to MP4 and other formats using Media.io and thus it can be said that works as a DVD to MP4 online converter as well. The program needs no download or installation and the interface is simple to use. 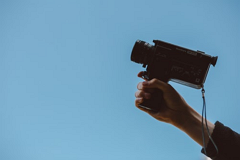 The output quality of the video is also good and the process is fast. 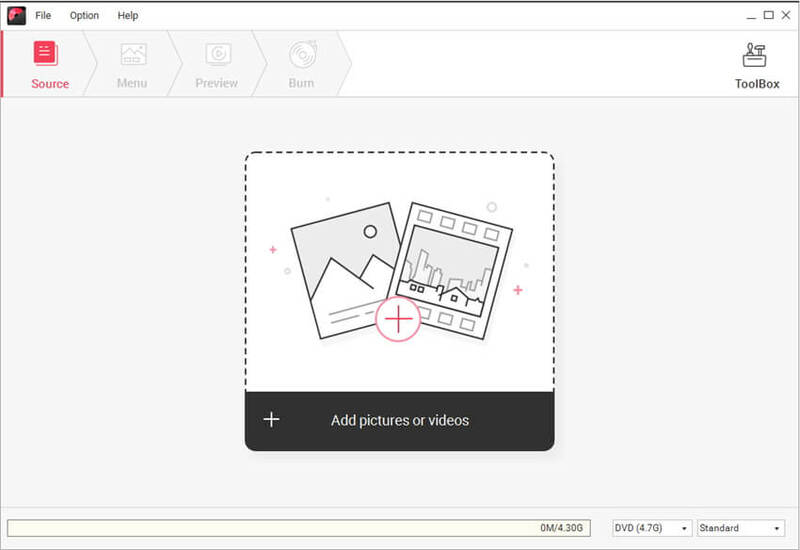 Step 1: Open https://www.media.io/ on your PC browser. Step 2: Click the + Add your files option to browse and add MP4 videos from your PC. If you want, 2 files can be added at a time. Step 3: At Convert to: drop-down menu, select VOB format from the Video tab list. Step 4: Finally, click Convert to start the process of burning your MP4 videos to VOB file format. After the completion of the process, converted VOB file can be downloaded from the program interface. You can also save the converted file to the Dropbox. Another popular MP4 to DVD converter online free tool is Files Conversion from Dan’s Tools. The program needs no installation and can be used directly from your PC browser. A number of file formats for conversion are supported by the program including MP4 to VOB, 3GP to AVI, WMV to FLV, and others. Using Files Conversion, you can also choose the quality of your output file from Low, Moderate, High and Very High options. It also facilitates selecting the file size in terms of resolution. Step 1: Open https://www.files-conversion.com/video/dvd on the browser of your PC. Step 2: Click Select a File to add MP4 videos present on your system. Step 3: From the Convert to DVD tab, select the output format of the file. Step 4: Select Quality and Size of the output video. Step 5: Finally, hit Convert to move ahead with the process of conversion. Once the MP4 file is uploaded and converted, you can download it from the interface. Zamzar is a popular name when it comes to MP4 to DVD format converter online. Using the program, you can burn your MP4 videos on your PC to DVD supported format. In addition to local files, you can also add the URL of the videos for conversion. The converted file link is sent to the mentioned email address from where they can be downloaded. The interface of Zamzar is simple to use and the process is fast. The output quality of the file is also decent. Step 1: Open https://www.zamzar.com/convert/mp4-to-DVD/ on your PC. Click Choose Files to add MP4 videos from your PC. You can also drag and drop the files. Step 2: At the Output format tab, select DVD from Video presets list. Step 3: Enter your email address where you want to get the link to the converted file. Step 4: Click Convert to move ahead with the conversion process. The MP4 files will be uploaded and converted to DVD compatible format. The link to the file will be sent to email ID from where you can download it. Majority of online MP4 to DVD converters are free to use and thus popular among people. One thing that needs to be considered here is the fact that these online converters only do a partial task in MP4 to DVD conversion process. In reality, when you use an MP4 to DVD format converter online tool, you basically convert your MP4 videos to VOB which is the video format of DVD. A DVD consists of different structure files among which video is one of them. So using an online converter does not result in complete burning of MP4 files to DVD, instead, it is just a video conversion from MP4 to VOB format. · Best online MP4 to DVD converter alternative to burn MP4 to DVD with customized features. · Burn video/photo/audio files in any format to DVD/Blu-ray Disc/Data Diso/ISO File. 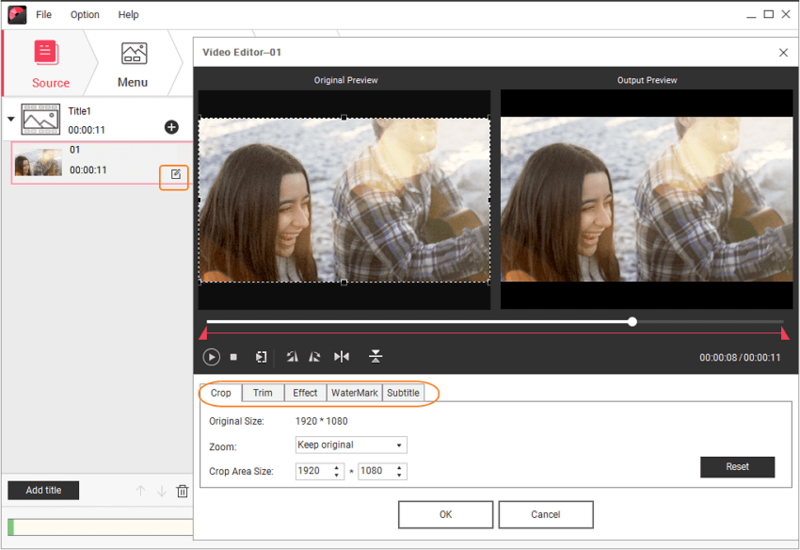 · Edit MP4 videos with Crop/Trim/Rotate/Watermark/Effect/Subtitle and other features before burning. · Comes with 100+ free DVD menu templates from Travel, Family Life, to Sport themes. · Customize MP4 to DVD menu further with features of changing background music/picture, text, chapters, etc. · Toolbox with more functions including Data Disc, ISO to DVD, Video Editor, Slideshow Maker, One-clcik Burning, and others. · Convert MP4 to DVD with real-time preview, super fast speed, and high-quality output. Step 1 Open Wondershare MP4 to DVD converter and select disc type. 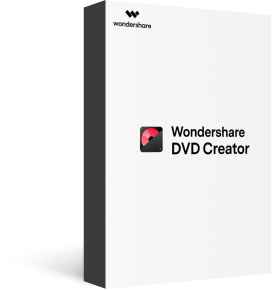 Launch Wondershare DVD Creator on your Windows PC. Next, select Create a DVD Video Disc option. Step 2 Add MP4 files for MP4 to DVD conversion. On the software interface, hit "+" under the Source tab to add the MP4 files present on your PC. You can also drag and drop the files to the program. Batch processing is facilitated as multiple files can be added. After videos are added, they will appear as a thumbnail on the left side of the interface. Step 3 Edit MP4 files (Optional). The program comes with built-in video editor for video customization. To make changes to the video, hit the pencil icon beside the video thumbnail, you can also right-click on the thumbnail and select Edit option from drop-down menu. 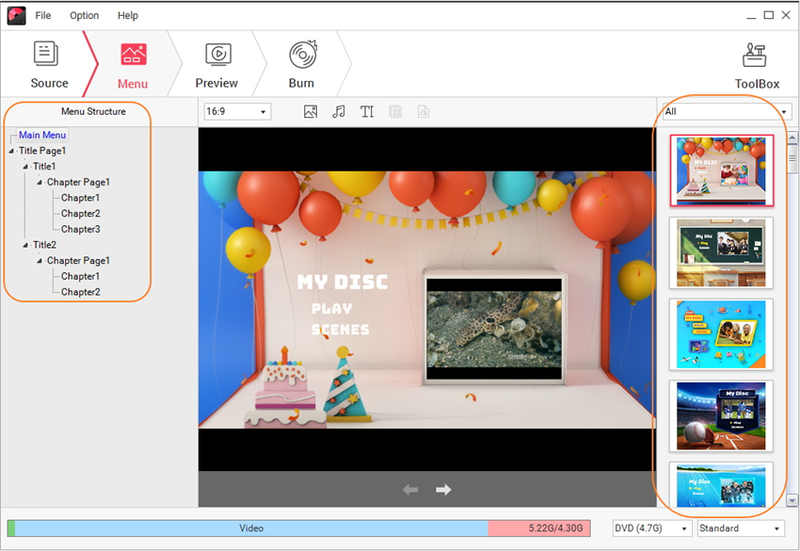 A pop-up Video Edit window will appear from where you can select options to Crop, Trim, WaterMark, Effect, Subtitle, and perform other functions. Click OK to save the changes. Step 4 Select DVD menu template and customize it if you want. Select your DVD template by clicking the Menu tab from the primary software interface. There are a list of template designs on the right side of the interface. Double Click to apply a template if you like, and setting background image and music, adding text, creating more chapters, and others by hitting related icons. Step 5 Preview DVD and Convert MP4 to DVD. Hit the Preview tab to view the created DVD. You can also go back and make changes if needed. After that, hit the Burn tab from the program interface and a pop window will appear, you can set Disc Label, Burner, TV Standard, Disc playback mode, Folder path and others as you wish. 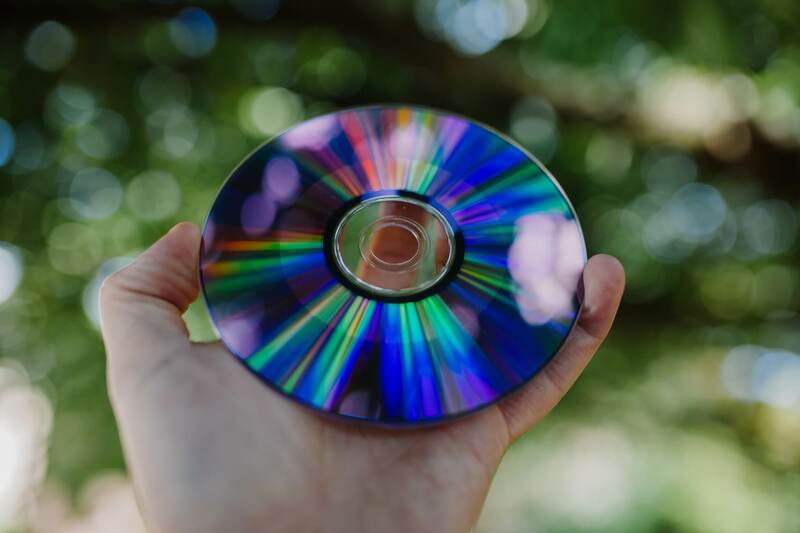 Make sure that you have already entered a blank DVD disc in your system, and finally click Burn to start the process of MP4 to DVD conversion. Overall, Wondershare DVD Creator proves to be a better option than online converters due to a number of reasons. First of all, the Wondershare MP4 to DVD program facilitates complete burning MP4 to DVD structure unlike online tools that basically converts MP4 format to VOB. Secondly, the desktop software allows selecting DVD templates, adding customization, editing videos, and a number of other additional functions. Have a free trial now.